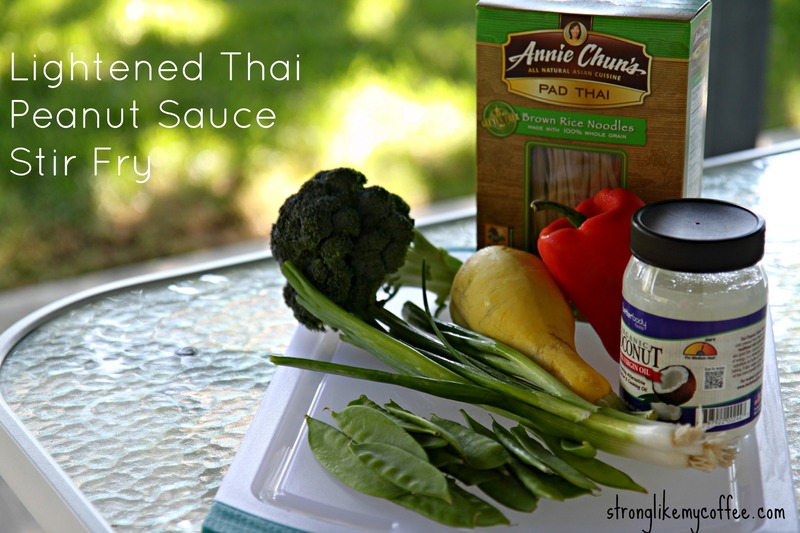 Lightened Thai Peanut Sauce Recipe + A GIVEAWAY! You are going to love today’s post :) Following this new fun recipe, you will find a special giveaway to enter! Sometimes I get into a dinner rut, making the same handful of recipes every week. On Sunday, I took advantage of a few extra hours in the late afternoon to “play” in the kitchen. 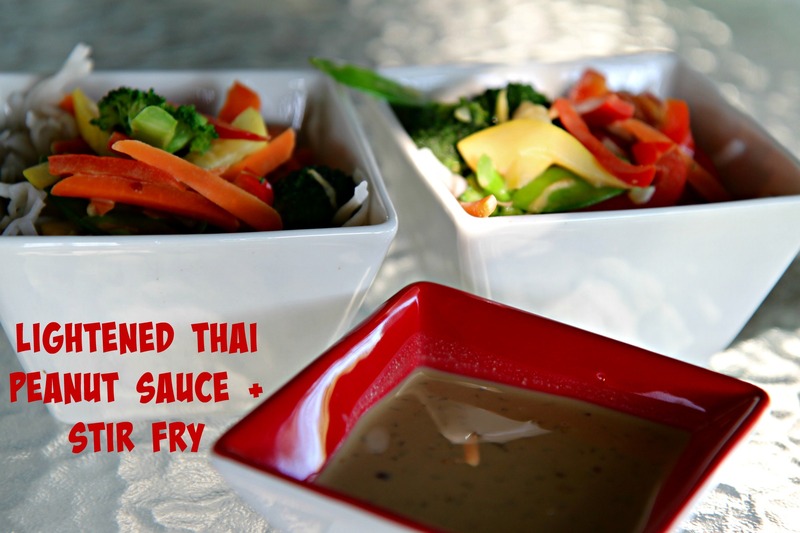 You already know I love to “health-ify” recipes, and this time I tried my hand at creating a light low-fat Thai Peanut Sauce to go over stir fry veggies and brown rice noodles. Spending some time in the kitchen, cutting up veggies and making my own sauce is a refreshing alternative to staring at a laptop or binge watching TV shows. While I was listening to music and taking blog pictures of my bell peppers, I thought “So this is what post-grad life is like….” I’m so used to spending my Sunday nights doing homework, studying, or getting ready for class on Monday. I can get used to this new schedule! :) Especially if it means more meals like this one. 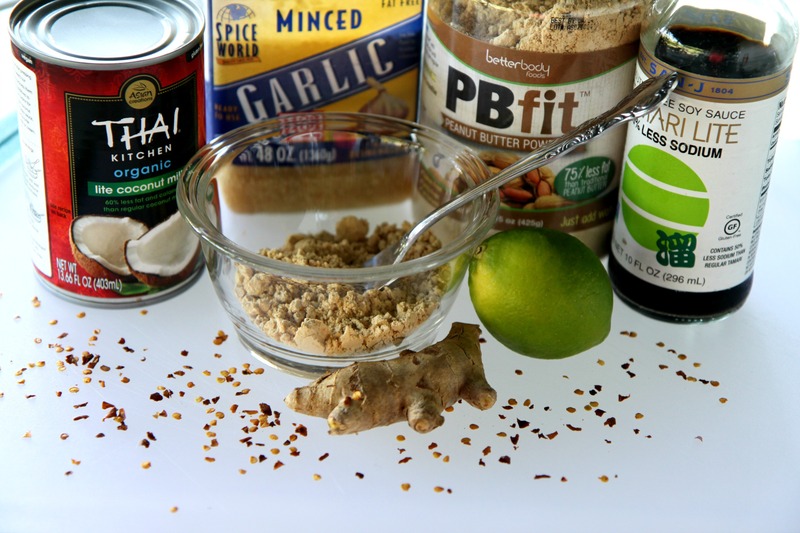 This Thai Peanut Sauce reduces its fat and calorie content significantly by using PBFit rather than regular peanut butter. Most sauces and dressings pack an exorbitant amount of calories, fat, sodium, and sugar. I’m a huge fan of homemaking sauces when possible to reduce excess fat and sodium, and eliminate funky chemicals and preservatives. PBFit is a powdered peanut butter that reduces its fat content by 75% by dehydrating the peanuts and squeezing out its oils. It is perfect for this recipe because it still retains all of the peanut-y FLAVA we’re looking for! Other modified ingredients included a lite, organic coconut milk and a reduced-sodium soy sauce. 1.) Whisk together peanut butter and coconut milk. 2.) Whisk in soy sauce, garlic, ginger, lime and red pepper flakes. 3.) 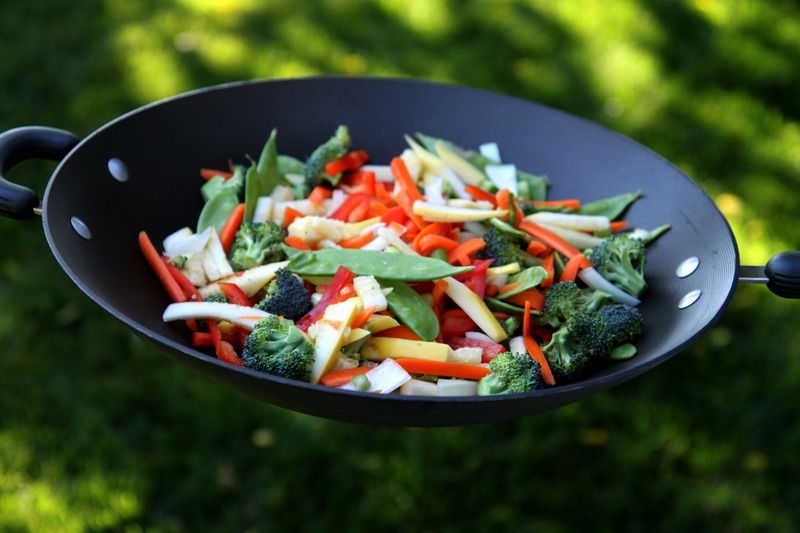 Set aside sauce until you are ready to add to your stir fry veggies. Oh my gosh, I was so happy with this sauce! The peanut and coconut flavors are amazing, with just enough spice from the red pepper flakes. This tasted like the sauce at Thai restaurants…I would love to try it as a dipping sauce for chicken kabobs next time. 1.) In a large skillet, heat 1-2 Tablespoons of organic extra virgin coconut oil. 3.) Add Lightened Thai Peanut Sauce, stir, and remove from heat. Any dinner with four or more colors is a winner in my book! I learned a while ago that the quality of our food should not be sacrificed for cost or convenience, if possible. Pre-made sauces and meals just can’t offer the nutrients and health benefits that whole fresh ingredients can. Obviously it isn’t practical to homemake 100% of our sauces, dressings, and condiments but we can make healthier choices by reading nutrition labels, sticking to serving sizes and making alternatives when available. This giveaway will remain open until Thursday at midnight. One winner will be randomly selected and announced right here on Friday! 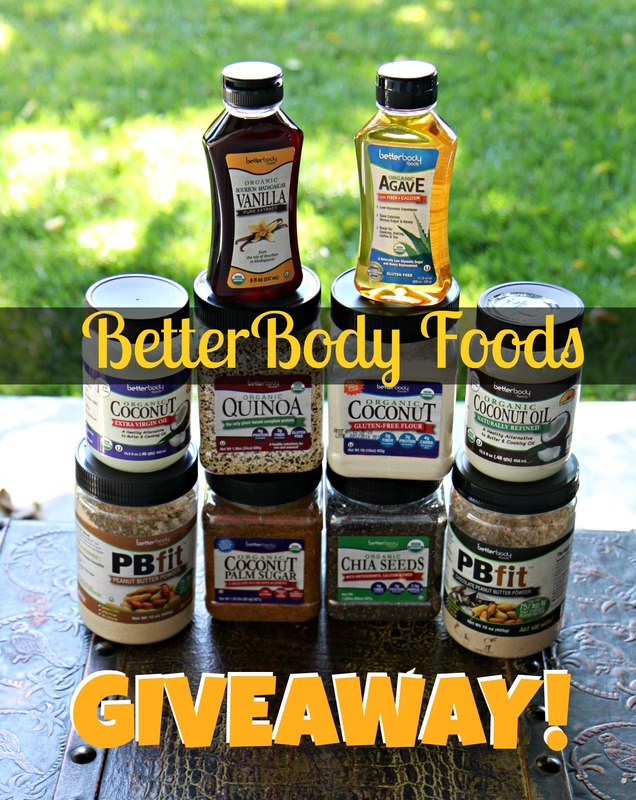 Posted on June 1, 2015, in Healthy Habits and tagged betterbody foods, giveaway, healthy college girl, homemade sauces, lightened thai peanut sauce recipe, pbfit. Bookmark the permalink. 77 Comments. I follow Better Body Foods on Instagram as @fiddlindandi. My favorite way to use peanut butter, aside from in a cookie or chocolate related dessert, is on warm toast. I love all these products that your showing!! I literally use peanut butter for everything! From shakes and smoothing, to eating with Apples and snacks. I use it so often that I catch myself putting it with recipes that I wouldn’t have even though to try it with. Can you tell me the best recipes that you use it in so I can try!! I’m totally not creative but I love to make peanut butter and banana sandwiches. Yum. I love to use peanut butter on top of sweet potatoes with a sprinkle of cinnamon! I like peanut butter in my favorite quick breakfast smoothie. I blend a TB of Peanut Butter with a banana and some almond milk. SO easy. If I want it to be more like a milkshake, I use a frozen banana and add some crushed ice. Peanut butter on toast! Or oatmeal! I’d really like to try better body food products though! I follow both on IG. Using PB fit in making vegan chocolate chip bars is the best non guilt sweet treat ever! I am a stay at home mom with 2 fur babies that get very sad when I leave the house. I decided to put some PB fit in their Kong that is filled with some of their non fat dog food, now they get so excited when I get ready to leave. I give them their Kong and leave as they are happy licking their treat and not even acknowledging me as I’m out the door.